largest Sockeye salmon in the world. 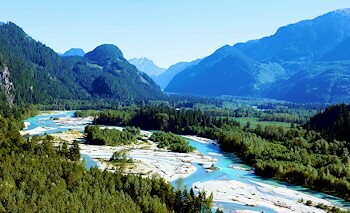 Pitt River Lodge is located near Vancouver, British Columbia. Despite being close to Vanouver, the largest city in Western Canada, the Pitt River has kept its wilderness qualities because it is so difficult to access. Our location can be reached by water or air only, think of it...there are no crowds! 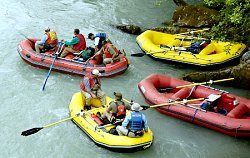 Come and see us at Pitt River Lodge where 40 kilometers of river await you. Our boat departs regularly from the head of Pitt Lake, just outside Maple Ridge, BC. After a 35 min ride across Pitt Lake, the largest freshwater tidal lake in North America, in our aluminum, cover and heated crew boat, you are taken up a short logging road to the riverside lodge. 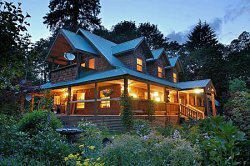 Our 5000 square foot farmhouse style lodge is the perfect place to experience the ultimate fly fishing adventure! With a wrap around porch, cedar interior, hardwood floors, cedar burl bar, leather furniture and big screen TV, you and your group can relax and unwind in comfort at the end of the day. Dining is family style huge rustic redwood cedar tables, with good home-style cooking, scrumptious desserts and homemade breads. From here anglers depart daily for either guided or unguided fly fishing trips on a river that has been called one of Canada's best kept secrets. 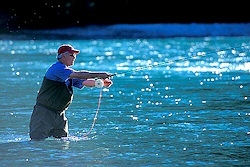 With big resident Bull, Cutthroat and Rainbow trout, the Pitt River offers year round fishing. Because the river has long been under catch-and-release regulations, the Pitt River offers fishing that's as good as anything you'll find in British Columbia's most remote wilderness rivers. Usually to get fishing like this you have to go to distant areas, but the Pitt River has it all, just a short distance from the city of Vancouver, BC. We are located on the edge of a great BC wilderness. During the fall salmon run, wildlife such as black bears and eagles can often be seen feeding on salmon along the rivers. Deer are plentiful and there are occasional sightings of mountain lions and the elusive Roosevelt Elk. The region is rich in bird life in season. The area is typical of a British Columbia west-coast rain forest. At the head of the valley, giant old-growth trees can still be found. For those who want to relax after fishing there is hiking or mountain biking. 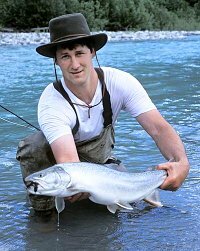 Guided and unguided wilderness fly fishing trips near Vancouver, BC, Canada.